We are engaged in manufacturing a wide range of slab support system that is customized as per the specifications of our clients. These are in wide demand due to high performance and compact designs. The flexible hand set system for floor slabs : wherever concrete decks of any floor plan have to be formed fast and economical, flex system with h16/h20 beam is the right formwork system. 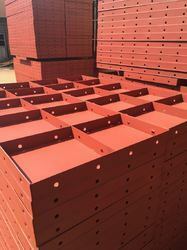 h beam flex is a fast, flexible slab formwork system for floor plans of any shape, for beams, floor extensions. the system forms any floor plan because, the joists overlap and the props can be spaced to fit. It will form any floor plan. Wall panels are made out of 45mm x 30mm x 4mm slotted angles and welded to 12 gauge M.S Sheet and suitably stiffened with 45mm x 30mm x 4mm angles. The decking in fill beams span between the main decking beams or between drop heads, to support the steel panels or plywood. Looking for Steel Slab & Wall Support System ?